I understand that the locking of children's hair is often a contentious issue, and while I respect that there are very strong opinions on both sides of the 'fence' - I personally do not have an issue with it as long as the hair is treated with respect and the child is happy. When parents bring their children to me they are welcomed into a judgement free environment. For me - locs aren't just a hairstyle - they are an expression. Whether that is an expression of faith, of culture, of creativity or simple preference - I believe each family is free to express themselves as they see fit - as long as it is not to the detriment of others. 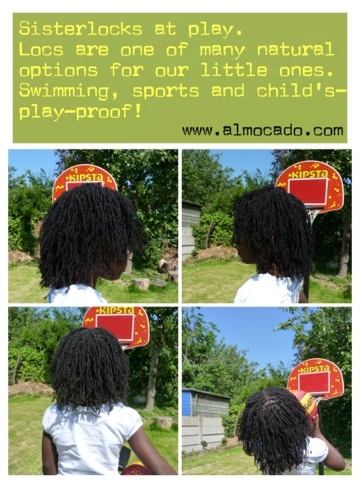 If the parents decide that locking their child's hair fits in with their lifestyle and personal ethos - then that is their decision and when the child grows up he/she can choose an alternative if they so desire. To those who argue that locking hair is 'just as bad as a relaxer' - I will remind them that locs do not involve the use of harsh chemicals. In my practice, I use only distilled water and my hands, to create locs. Hardly a fair comparison. As to the permanence of 'locs as a hairstyle' - they can be unpicked (taken down), grown out or cut. As long as the hair has been handled with care and the locs lovingly tended, the follicles should remain healthy. Installations do take time, and we work with your child to ensure that they are not sitting for torturous periods of time. I can assure you that no child who is weeping, wailing and gnashing their teeth will be locked on my time. It's not worth the hassle (to me) or the trauma to the child. To date - I have been fortunate enough to know that each of my little lockers have been happy to sit in my chair and play with their iPads or watch Disney movies while having their hair done. Locs are simply super-strands. We take individual strands of hair and interlock them to create stronger strands. It is 100% natural and in the right hands: 100% gentle and stress-free. We have so many options for wearing our natural hair (loose, twists, braids, cornrows, etc) and locs are just another (albeit long-term) option. As a loctician I will indeed be biased because my stance is based on my experiences. I see happy children who visit every 6 -8 weeks and just don't worry about their hair in-between. They don't get into 'good hair bad hair - long hair short hair' arguments or competitions. They just get on with life and I am proud of every little head I've been privileged to touch since I started this busines. They can be dressed up with ribbons, alice bands and barrettes - or left alone to hang freestyle. There are honestly bigger issues to worry about than whether your neighbour's child is locked or not. Love it. This is just what I am looking for. We just started our own blog abour me and my 5 year olds sisterlock journey. May I include a link to this blog article on my blog? Please advise and thank so much for the wise words.